It’s December which means it’s officially acceptable to bring out the tree and tinsel, decorate your house with festive figurines AND consume Christmas-themed baked goods before 8am. Which I have been doing since November, but, hey, at least now it’s not frowned upon. 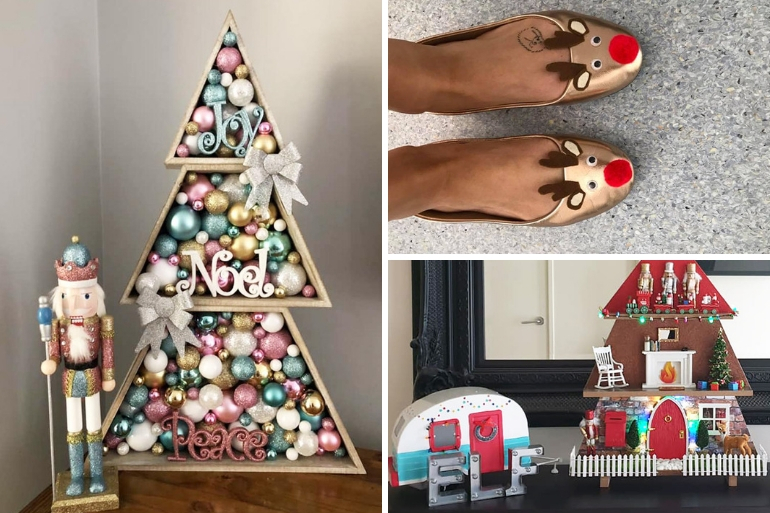 Because it’s just not Christmas without a Kmart Christmas hack post, we have collected some of our favourite decorating and gift giving ideas, using popular Kmart products. If you are planning to deck the halls via the aisles at Kmart, then these hacks are sure to help you get into the Christmas spirit. 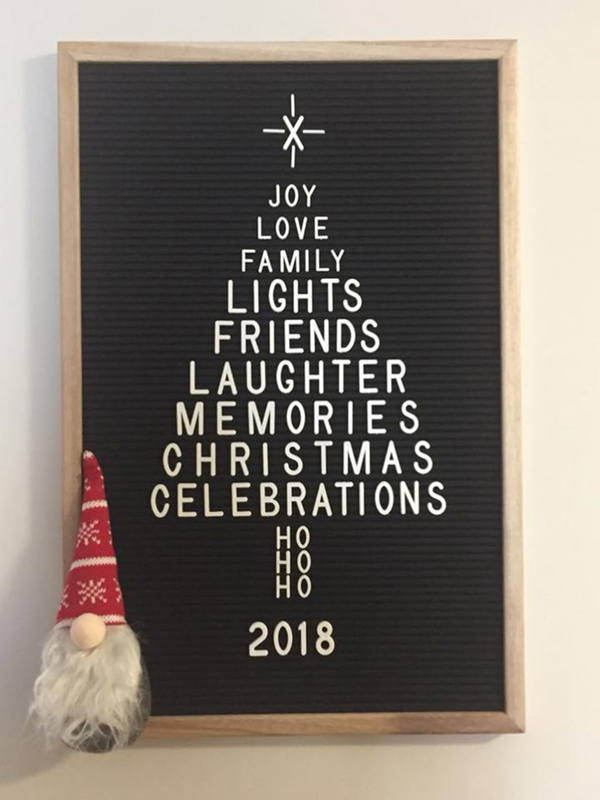 If you happen to have the Kmart DIY Letter Board, then why not add a festive message to it in the shape of a Christmas tree? 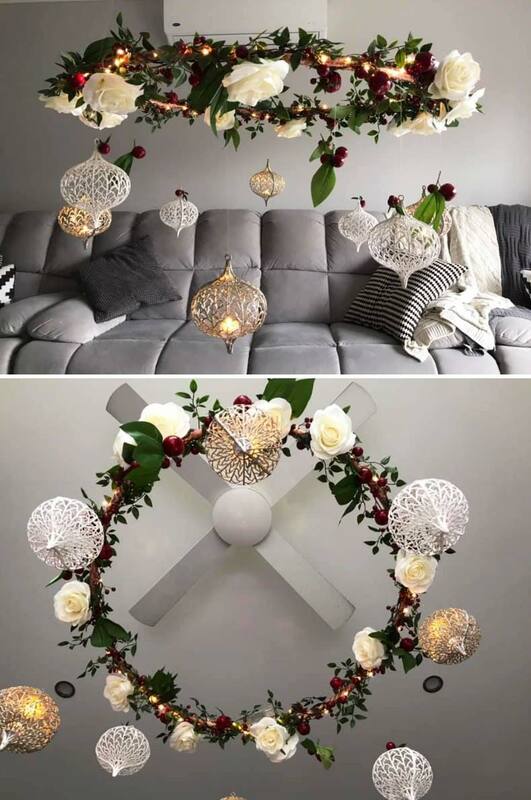 This mum has done the work for us so all you have to do is copy and display! 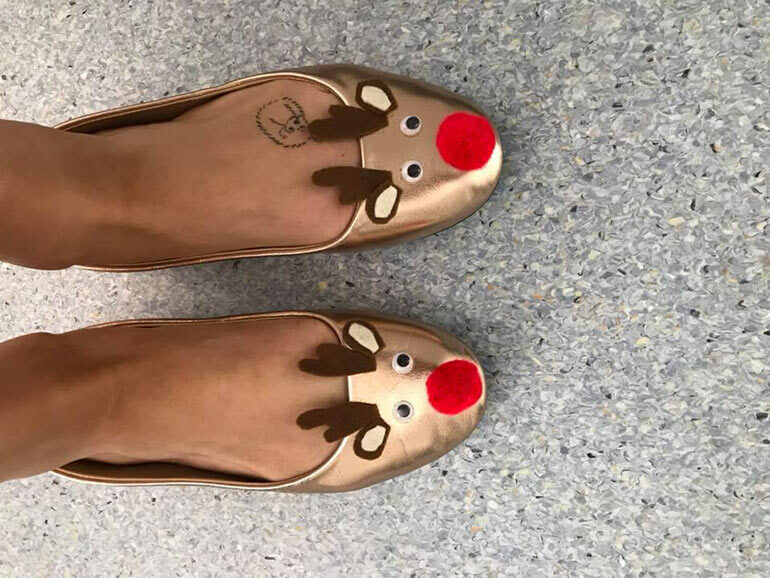 How’s this for a festive twist for your feet? Embrace the Christmas spirit by adding some eyes, pom poms and felt to the Kmart gold ballet shoes. The Elf on the Shelf gets up to all kinds of mischief at night. But where do you plop him during the day? 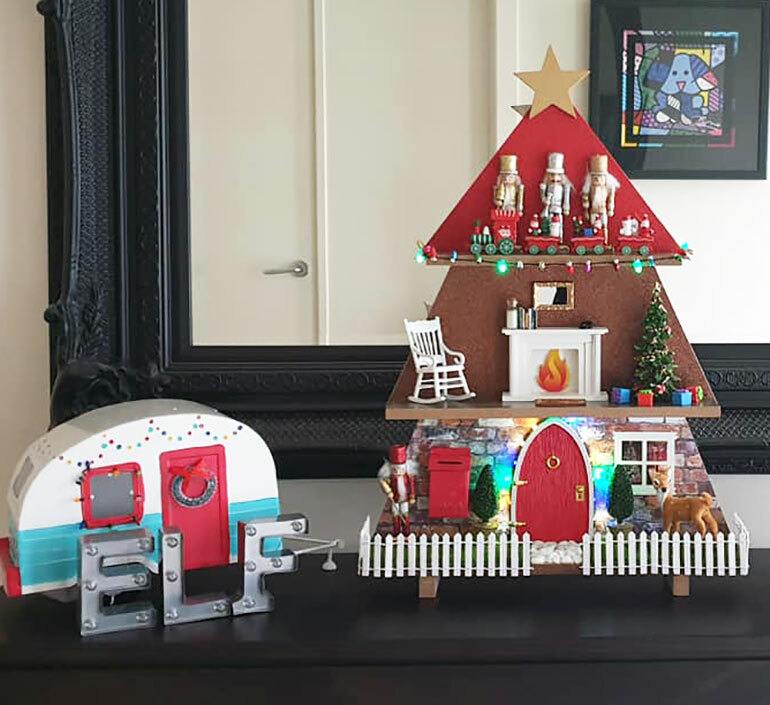 Clever mums are making their Elf a cute little house using either the $20 Kmart metal caravan or the $20 Kmart Christmas display shelf. Or, like the display below, BOTH! The $12 Kmart Christmas stacking tree is back for another year as well. Last year this little decoration proved to be very popular, especially for displaying ornaments and baubles. 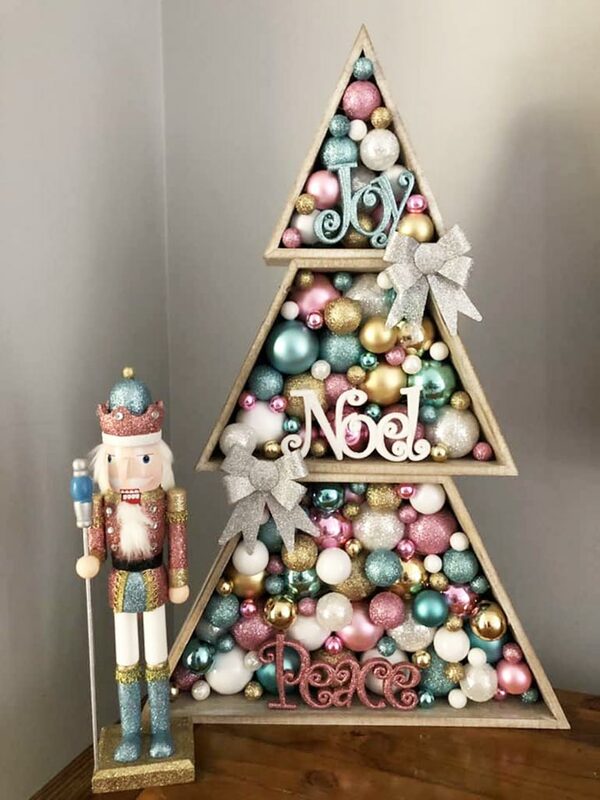 Check out what mums did with the stacking tree last year over at our Christmas Kmart Hacks 2017 post. 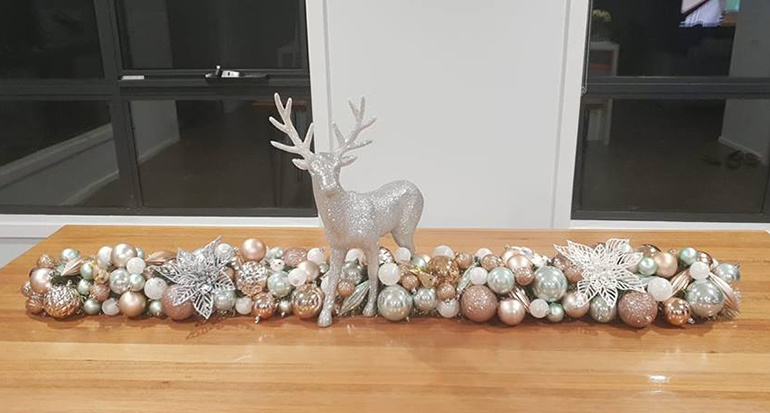 One very clever Kmart mumma managed to make this masterpiece for her Christmas table. 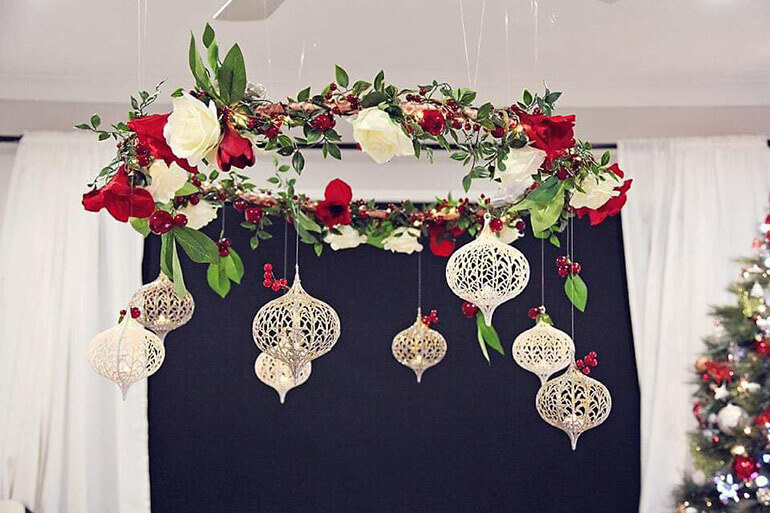 It’s a Christmas mobile, made from a Hula Hoop and complete with leafy and berry garland, decorative berries, artificial flowers and fishing line. All from Kmart, of course. She’s even added battery tea lights and copper lights to the sparkly mobile. Talk about talent! And what a great conversation starter around the Christmas table. Another hack that took off last year was using a pool noodle to make a Christmas wreath and centrepiece. This year the pool noodle centrepiece hack continues to gain momentum. All you need is a collection of baubles, a pool noodle and a glue gun. Pair it with the $12 glittery reindeer and you’ve got a beautiful way to dress up the dinner table. Check this popular item that arrived just in time for Christmas – Kmart’s brick wall wrap. This is perfect for making your very own fireplace. All you need is some empty cardboard boxes, the brick wall wrap and some tape to piece it all together. 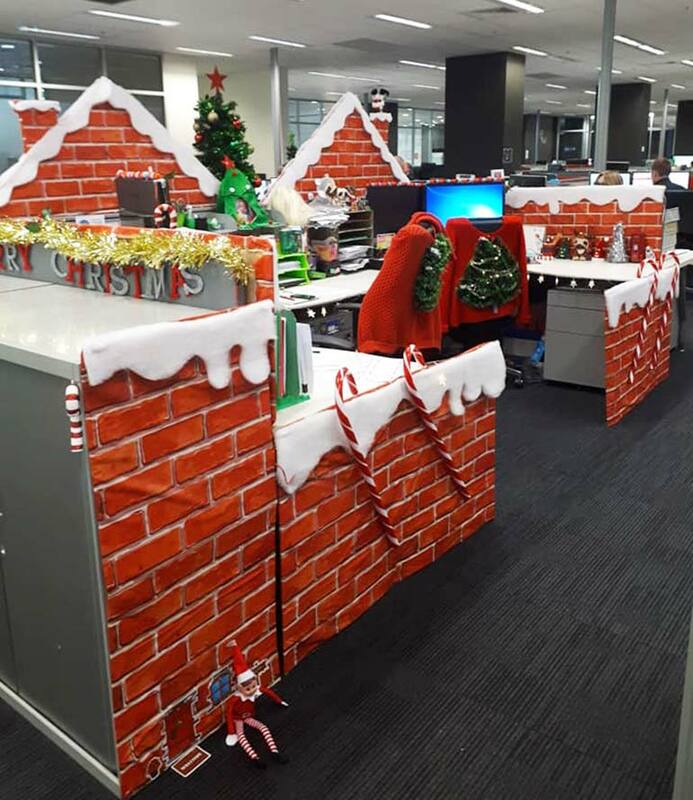 The brick wall wrap is also awesome for wrapping up your entire office and transforming it into Santa’s Workshop. How fun to arrive at the office and see this? Decorations done. Time to move on to the gifts. There are heaps of great gift ideas for daycare/school/kindy/ teachers at Kmart – candles, soaps, plants. 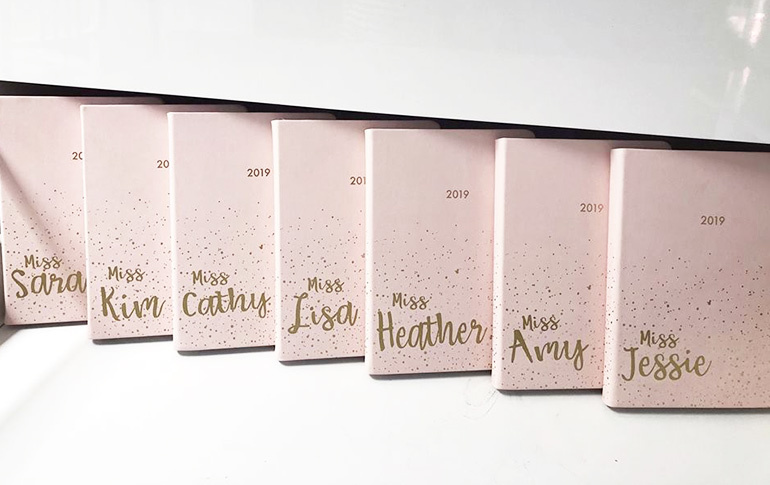 But we especially love this idea of using a $5 diary and adding personalised stickers to the front. 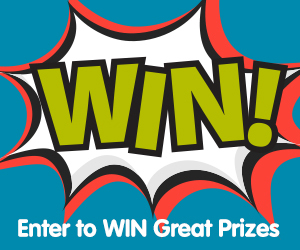 Add a personal message or a little picture to the inside. 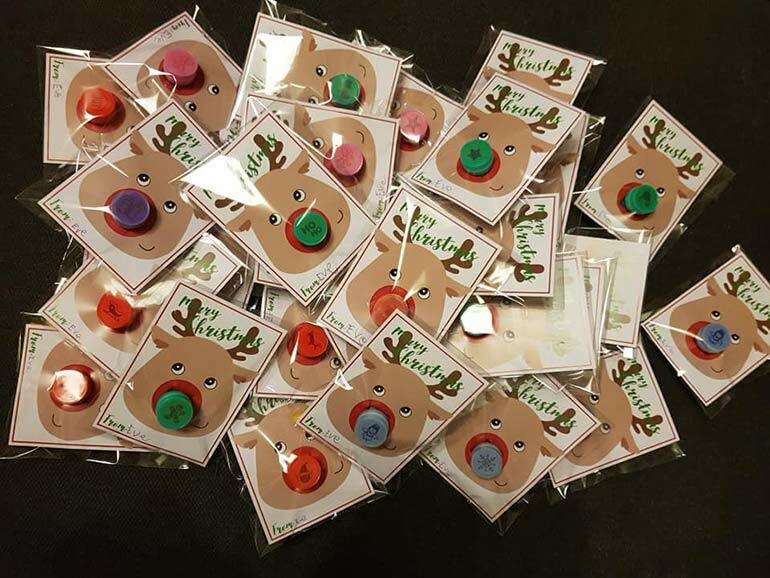 Last year one of the clever Kmart mums came up with the idea of using the Christmas stamp collection as part of the Christmas cards for the class. And this year it’s continued to be a huge hit! 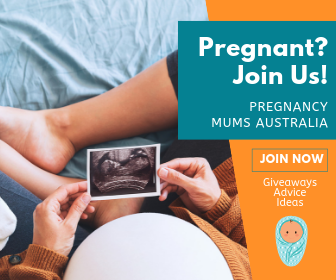 Another super simple way to add something special to the end of the year? 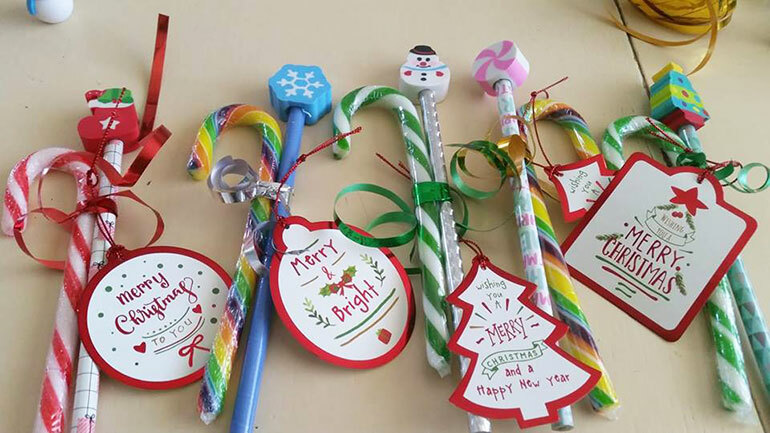 Mini Christmas cards combined with candy canes and a cute Christmas pencil. You can get all the supplies at Kmart. $1 for the Christmas tags, $5 for the pencils and $2 for 2 x10 candy canes. While there is no storage of toys available, once kids get to a certain age they can become a little hard to shop for, especially if you’re on a budget or unsure of what they have/need. Enter the $10 shadow box. This product is great for displaying all sorts of things, including your baby keepsakes. But it’s also a thoughtful way to gift money, chocolate and other surprises without just handing them cash in a card. Finally, how will you wrap all of these great gifts? Well, you can use regular wrapping paper. 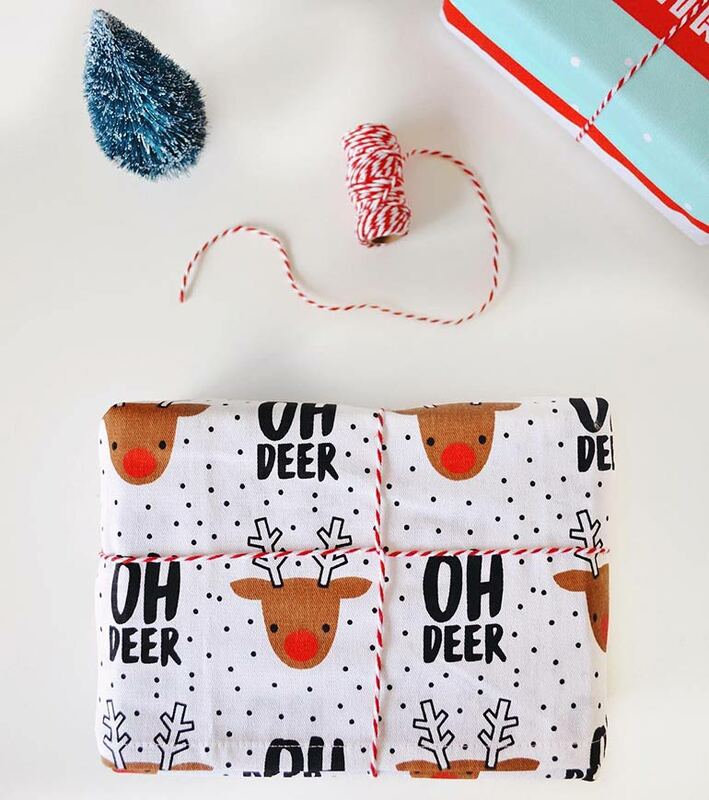 Or you can opt for a reusable option and transform these cute Kmart tea towels into gift wrap. 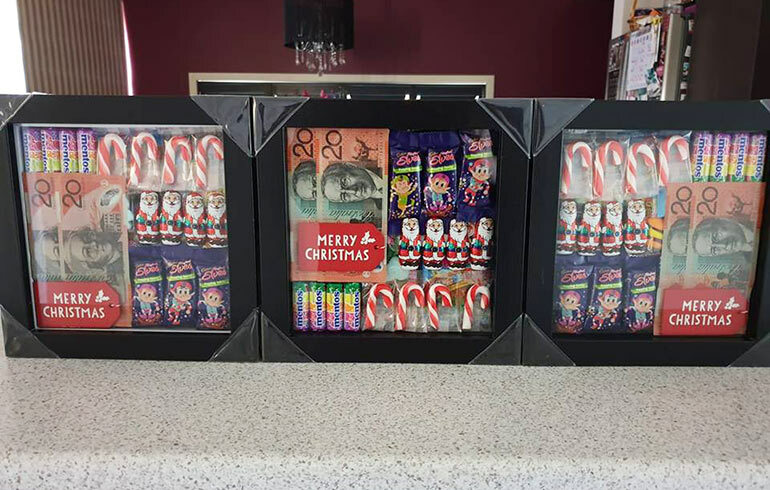 It might not be economical for all the kids’ gifts, but what a great idea for those special gifts for teachers, workmates and extended family! 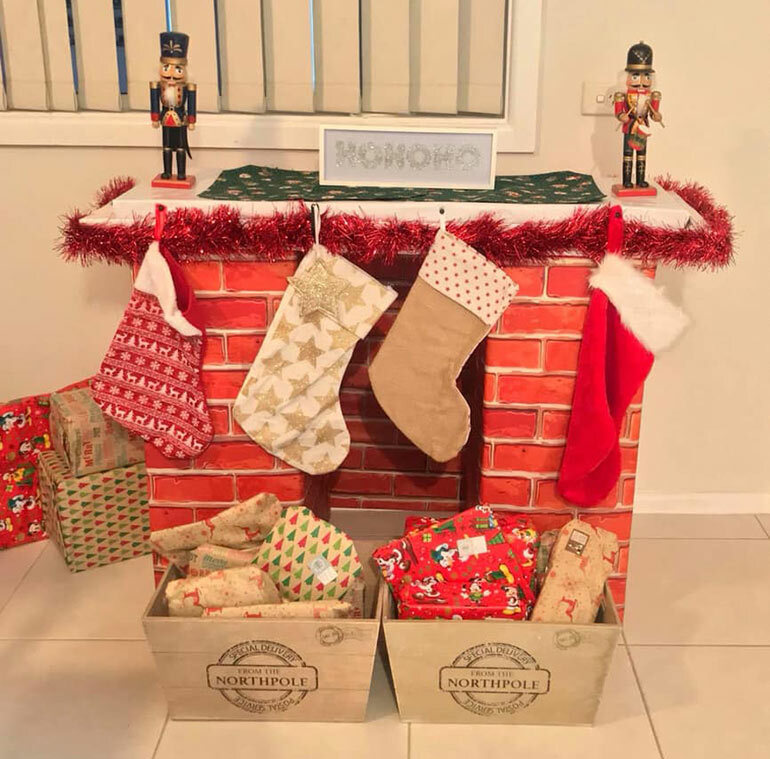 Photos courtesy of Kmart Mums Australia, Kmart Hacks & Homes, Kmart Christmas Mums and Dads and Instagram.